Approximate Dimensions: Exterior - 17" W X 11" H X 5" D; Interior - 17" W X 10" H X 5" D; Interior Removable Zippered Bag - 12.5" W X 9.5" H X 2.5" D; Shoulder Strap (fully extended) - 24" shoulder drop (on interior removable zippered bag). 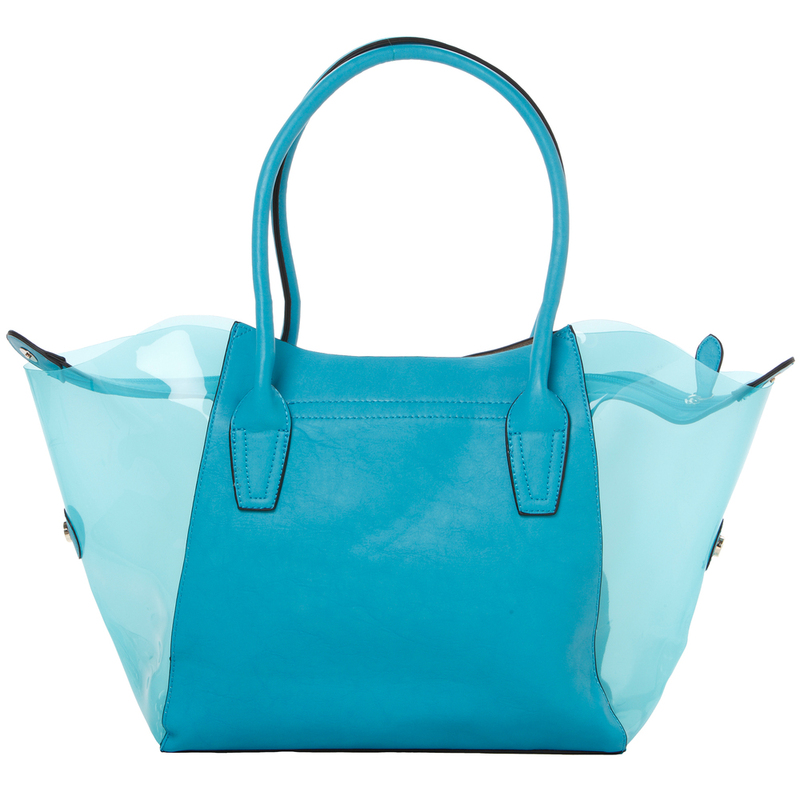 Classic style gets a modern twist with this beautiful fashionable handbag! While this tote purse features timeless elements like the always-stylish leatherette and glamorous gold-tone hardware that are sure to keep you looking good season after season. This fabulous women's handbag also boasts panels made of sleek, transparent plastic that kick this shoulder bag's style factor into high gear. The heart-shaped cutouts on the front panel also add a touch of sweet, flirty fun to this fashion daybag, making this satchel tote the perfect accessory to keep you looking stylish and on-trend from day to night and from work to play. Beneath the stunningly stylish exterior, this top handle bag's roomy interior helps keep daily essentials secure, organized, and close at hand, thanks to the zippered pocket and to the removable zippered bag that features fabric lining and 2 slip pockets. You can use the zippered bag inside the main handbag, or you can remove it and attach the adjustable and removable shoulder strap to it to use the zippered bag as a stylish purse in its own right. The main handbag comes with 2 sturdy top handles that make it easy for you to carry this handbag wherever you go and bring fashion-forward style to any ensemble.